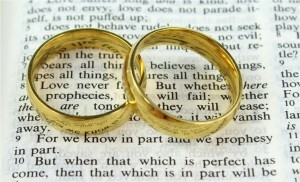 Christian Marriage is a public commitment to a lifelong relationship between a man and a woman. We love weddings at St.Peter’s. There is, of course, a legal element to the ceremony, including the signing of the Registers at the service but, above all, weddings are a celebration and we aim to reflect this in our wedding services. For us, the vows are all important. Every spring we offer marriage preparation to help couples think through the rich meaning of the vows and help you plan your service. If you are thinking about getting married at St.Peter’s, the first step is to contact the Church Office and you should do this before choosing a date or making any other arrangements.